We highly recommend the Ten Talents Cookbook, although we do remove the oil from the recipes. A best-seller, Ten Talents first published in 1968 (over 40 years ago) and now in a new, expanded, pictorial edition. The 21 informative chapters are packed with updated information, over 1,000 healthy recipes, a natural foods glossary, simple food combining, baby feeding, beverages, breads, desserts, fruits & fruit salads, grains, herbs & seasonings, meatless main dishes, nuts, seeds & olives, vegetable salads, salad dressings & dips, sandwiches & spreads, sauces, creams & gravies, soups & stews, sprouting, vegetables & side dishes, meal planning & menus, canning, freezing & drying, dairy & cheese substitutes, a section for those on a transition diet, and a chapter on the 10 healthy lifestyle principals for abundant health. Ten Talents is comprised of 675 pages, beautifully and artistically illustrated with more than 1,300 color photographs. A masterpiece you will cherish! 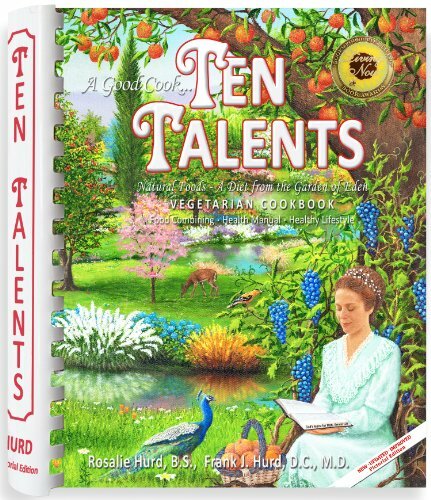 Product Description: TENTALENTS...Improved...the Award-winning classic natural foods vegetarian / vegan cookbook / health manual emphasizing God's Original Diet for humans, takes you back to the Garden of Eden and a diet as found in the Bible- Genesis 1:29. Over 1,000 heart-healthy, low fat, low sodium, high fiber, cholesterol free, recipes, with the natural goodness of whole plant foods; including grains, raw fruits and vegetables, nuts, seeds, legumes and herbs, in proper combination, for peak endurance, optimum health and nutrition. Compiled from the storehouse of real foods without the use of animal or dairy products, refined sugars, or harmful additives. A best-seller, TEN TALENTS, first published in 1968, now in a New, Expanded, and Improved, Pictorial Edition. The 21 informative chapters are packed with updated information, including: over 1,000 healthy recipes, a Natural Foods Glossary, Simple Food Combining, Baby feeding, Beverages, Breads, Desserts, Fruits & Fruit Salads, Grains, Herbs & Seasonings, Meatless Main Dishes, Nuts, Seeds & Olives, Vegetable Salads, Salad Dressings & Dips, Sandwiches & Spreads, Sauces, Creams & Gravies, Soups & Stews, Sprouting, Vegetables & Side dishes, Meal Planning & Menus, Canning, Freezing & Drying, Dairy & Cheese Substitutes, a section for those on a transition diet, and a Chapter on the 10 Healthy Lifestyle Principals for Abundant Health.